Sixty-three people die by suicide with a gun every day. In 2016 alone, almost 23,000 people used a gun to end their lives. Firearm suicides have gone up nearly every year since 2006, but we are anything but helpless to stop this crisis. You can't talk about the epidemic of gun violence in this country without talking about suicide. Suicides make up such a disproportionate number of shootings in this country, but the issue doesn’t get nearly the attention it deserves. 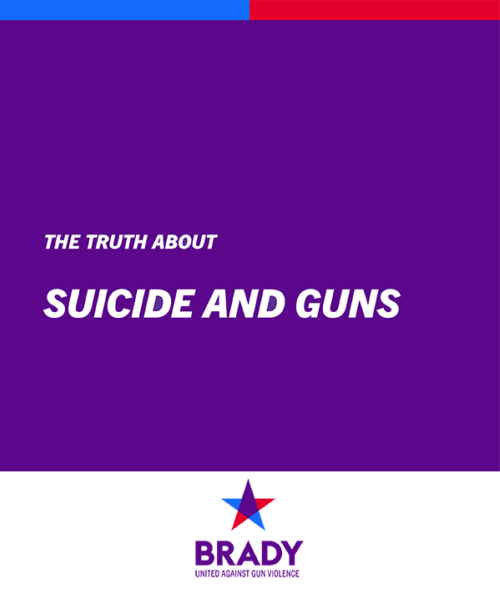 In 2016, the nearly 23,000 suicides by gun accounted for about twice as many deaths from suicide by suffocation, three times by poisoning, and twenty times more than intentional falls. Attempted suicide by gun results in death 85 percent of the time, compared to just 3 percent for other methods. White men make up 85 percent of suicide by gun victims, and men over 40 make up about two-thirds of suicide victims. About 20 veterans die by suicide in the U.S. every day; approximately two-thirds of them use a gun. More than two children and teens a day shoot and kill themselves, half of whom are under the age of 16. Entering mental health records into the state and federal background check system to ensure that those at risk of harming themselves do not have ready access to a gun. If you or someone you know is contemplating suicide, please call the free and confidential National Suicide Prevention Lifeline at 1-800-273-8255.